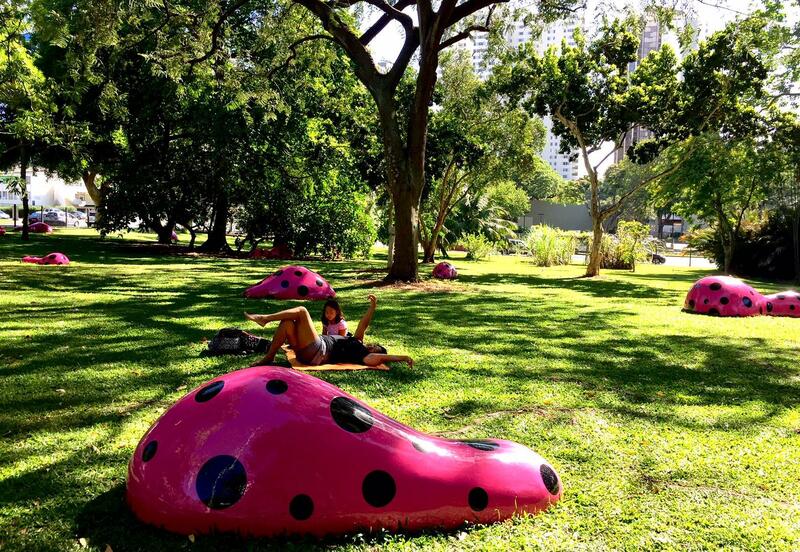 Yayoi Kusama's Footprints of Life has been exhibited around the world in different formations and environments. Going makai on Nu'uanu Avenue, look right as you hit Vineyard, there they are! Meant to represent islands in a green sea, everybody looks good with them. Joshlyn Sand is the new Director of the five Honolulu Botanical Gardens. 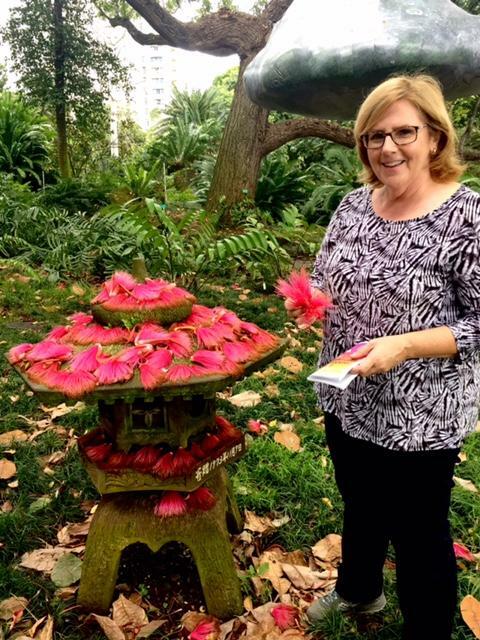 A horticulturist, she's pictured here with flowers from the shaving brush plant, one of Queen Emma's favorites. An unidentified rogue artist created this beautiful top hat for the Japanese stone lantern. 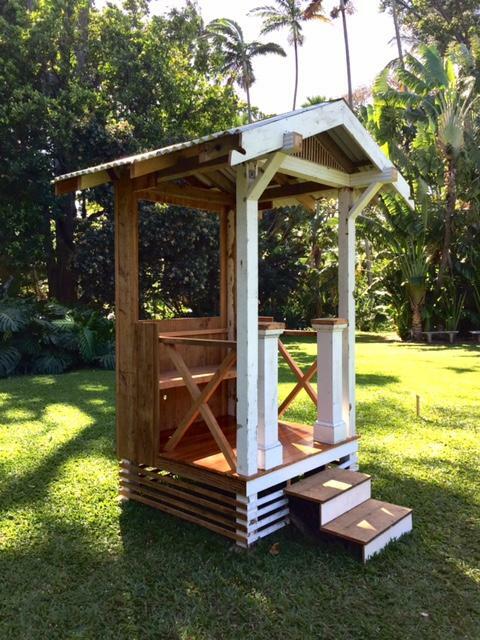 The Honolulu Biennial continues at Foster Garden and eight other venues in Honolulu through May 8. Foster Garden is open daily from 9 - 4pm. Check their workshop on ceramic succulent planters April 22nd. Docent tours are available. See another artwork by Yayoi Kusama at the IBM Building. 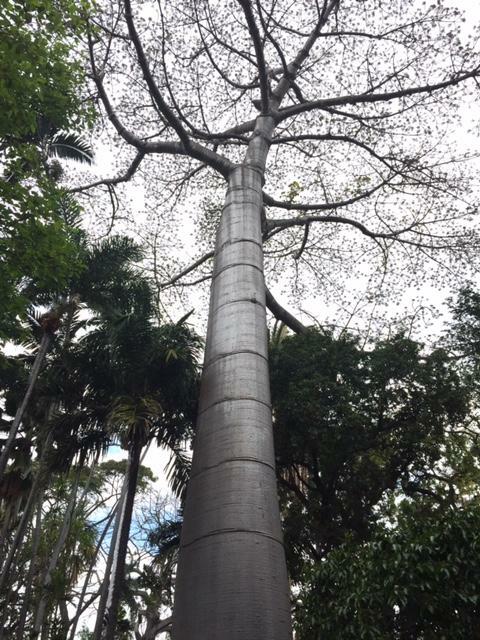 This Quipo tree from Panama near the entrance to the garden has just begun coming out of dormancy. 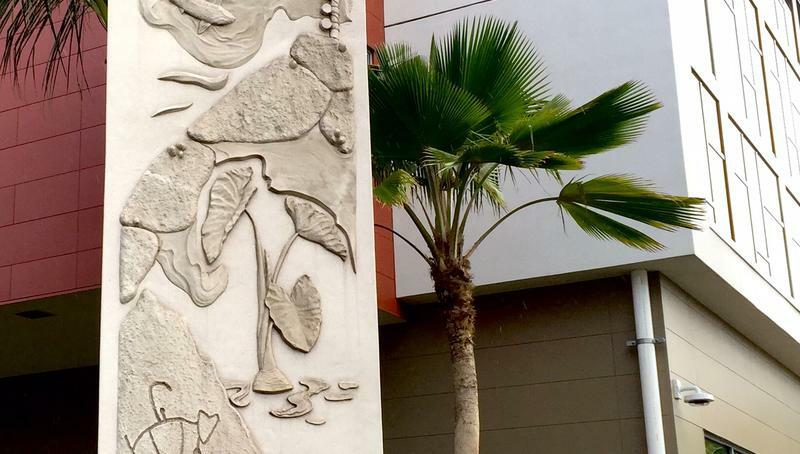 Foster Garden Director Joshlyn Sand says tropical trees need rest too. The wood of this tree is strong and light, like balsa, we're looking at leaf buds, which will soon start to open. 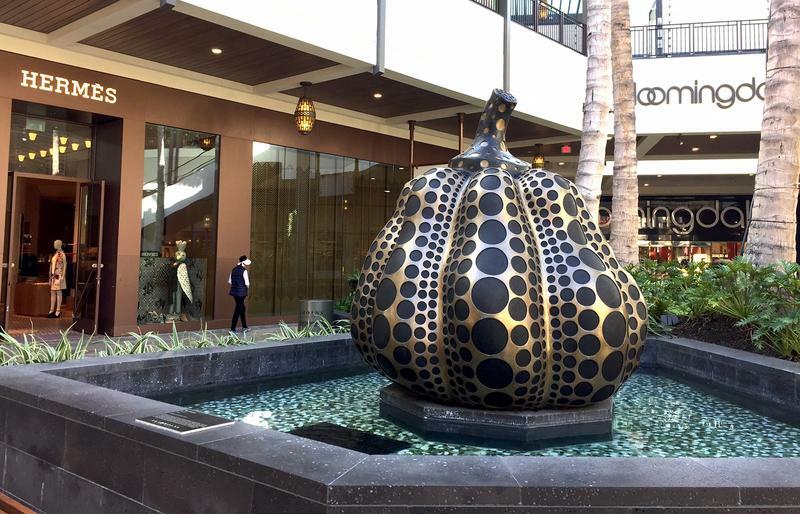 Kanani Silva and Danelle Mokuau work for Bank of Hawai‘i ---they’re volunteering for the Honolulu Biennial by keeping watch over Kusama's Islands of Life installation..
Joshlyn Sand is Director of Honolulu’s Botanical Gardens—Foster Garden is one of five. “We've had a really good visitorship bump. Weekends are particularly busy.” That’s what a Biennial’s about—art animating unexpected places all around the city. Andrew Binkley. Stone Cloud. 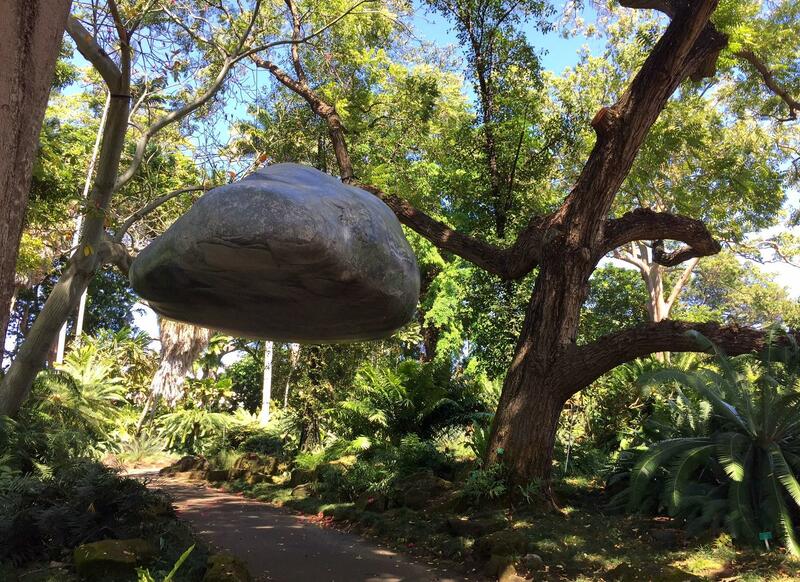 Positioned twelve feet above the pathway, this floating boulder actually weighs about 100 pounds and keeps its shape by means of air blowers. Kupa'a Hee, ceramic ipu. The quite beautiful rose ring parakeets pictured here are voracious feeders who travel in noisy groups, eating every seed in sight. Hee has watched them spread from Waikiki and Manoa to Nuuanu and Kalihi. This is the Cannonball Tree from Guyana. Its flowers have a sweet spicy smell and its fruit, cannonball sized, is quite fleshy and possibly dangerous. You can tell by the many signs nearby saying, Watch for falling cannonballs. Are people allowed to walk in here? This is as much a delightful installation as anything. 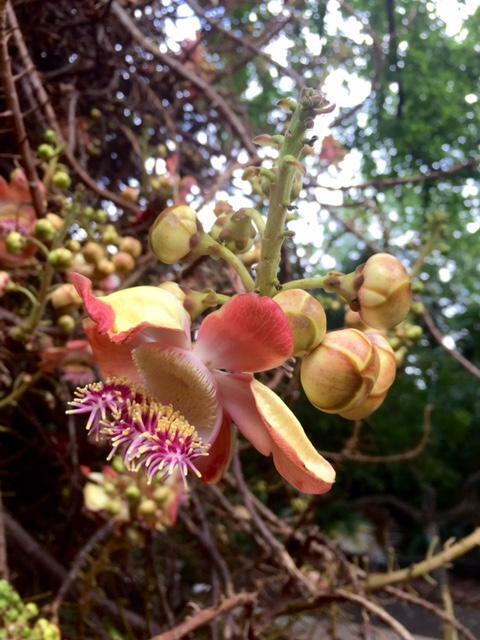 Flower of the Cannonball tree. Wow. Sand: “Over here, Kupaa Hee has ipus. He’s used an Italian etching style on these to put science and conservation messages on these ipu. You’ll see invasive species, and cultural icons on these telling stories. These are one of my favorites, I think they’re beautiful." 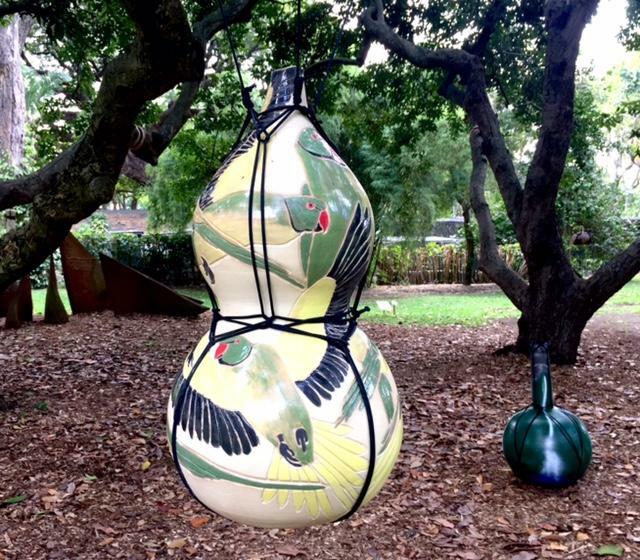 One ceramic gourd, or ipu, is titled “For the Instas” with a cell phone pictured next to an endangered tree snail. Artist/environmental scientist Kupa’a Hee, says social media is impacting Hawai‘i’s most remote places….because increased traffic degrades the environment. Rose ring parakeets, rats, sharks! Appear on these ipu, but people could be the most destructive. Sean Connelly. Thatch Assembly with Rocks (2060s). 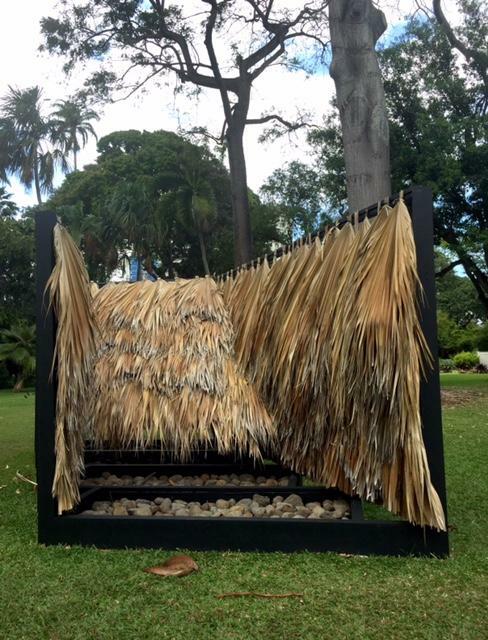 Recalling a traditional Hawaiian hale, the thatch is made of native loulu palm fronds gathered in Foster Garden. They will be recycled for use in traditional building after the installation. 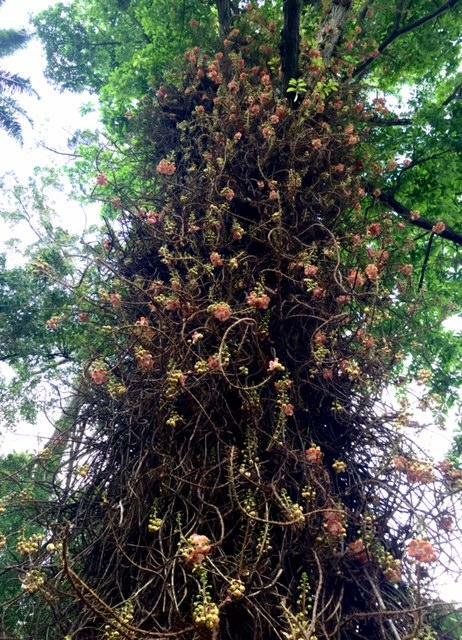 We’re looking up a towering tree with tangles of Medusa like vines projecting flowers from its trunk. Sean Connelly. Thatch Assembly with Rocks (2060s) (detail). 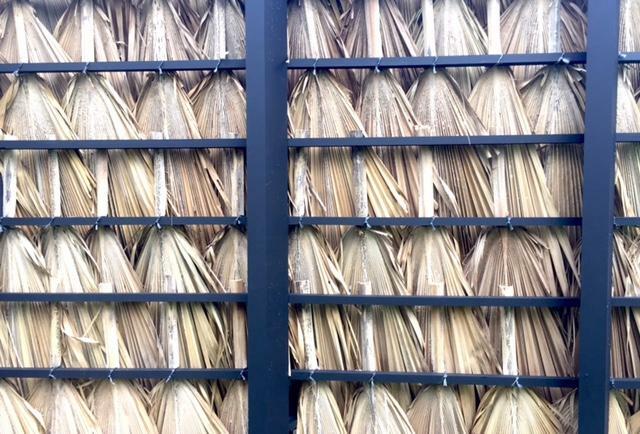 Connelly's piece deals with the use of traditional materials and their possible role in architecture of the future. We’re wandering a gentle rise to a grassy field and —Sean Connelly’s piece, Thatch Assembly with Rocks (2060s). Lynne Yamamoto. Borrowed Time. 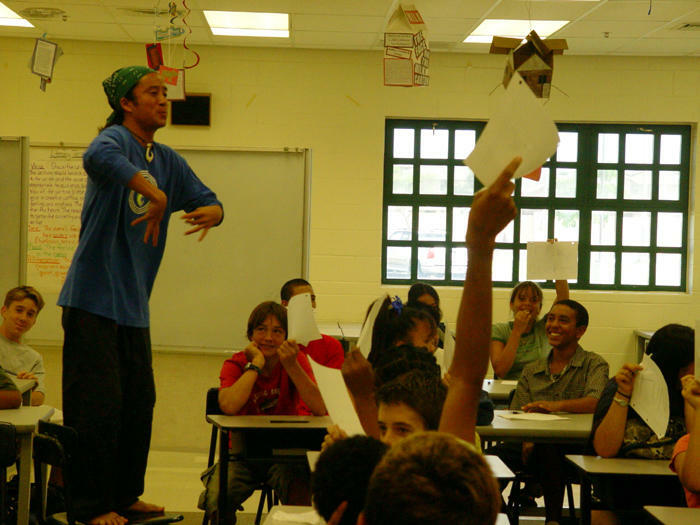 Yamamoto's work often references the plantation experience in Hawai'i. This simple, but witty plantation porch manages to recall so much, and be so welcoming. She’s done it in shorthand, yet she really makes me feel that plantation thing. She’s picked out just some key references that you look at and go, yeah! Yamamoto welcomes visitors to sit on her little porch, and you’ll want to. Sit quietly a moment and ----you fill in the blank.